It is completely outfashioned: Why do you still put CD-ROMs onto a tray while everything else like credit cards, diskettes or removable disks are slipped into their place in a more elegant way? In order to remove this anachronism 20 years ago clever engineers created the prototype of a slot-in CDROM drive, at the same time as the CD itself. However, the idea got lost and was reinvented just a few years ago by a single drive manufacturer. But I managed to get one of these prototypes and could even make them work. 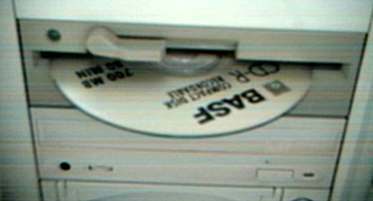 The picture shows how the CD-Drive slides a CD into it. The knob on the left insures that the CD does not get out of the drive when rotating at higher speeds. Just think about how well this design was at the time when you think about the high speed of today's CD-Drives. Since the version above was incompatible with small CDs, a special drive for these was invented. Due to the lower force the fixing knob is not needed here.